Our comprehensive service covers Liverpool, Aughton, Ormskirk, Southport, Crosby, Aintree, Kirkby, Childwall, Bootle and Skelmersdale. Why Choose Aintree Garage Doors? At Aintree Garage Doors, our family run business has the experience of over 16 years in the installation and maintenance of the best quality garage doors. We offer the best in value and quality workmanship, this is why most of our business is by recommendation from extremely satisfied clients. All work carried out by Aintree Garage Doors. No outside contractors. 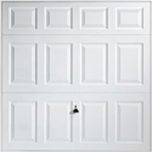 We have an almost endless range of garage doors in a wide range of styles. We have built up a reputation of delivering excellent service to each and every one of our customers and offer great after care service. Up & over doors are made up of one single panel. As the door opens it will retracts into the garage and will finish in a horizontal position. These doors are available as Retractable or Canopy. Our Steel doors are available in a range of colours. Sectional doors are made up of separate panels, this allows for a vertical smooth operation and are particularly suited for automatic operation. Sectional doors rise vertical and do not swing out onto your drive, allowing you to park close up to your garage. Side Hinged doors have a more traditional look, providing easy access to the garage without having to open the whole door. Aintree Garage doors are pleased to be associated with the Fair Trades Association. Fair Trades are the UK's largest multi trade association.